Looking For A Quality Patio in the South West? When it comes to choosing a supplier for your premium quality patio in the South West, look no further than CPR Outdoor in Bunbury and CPR Outdoor in Busselton. Whether you are looking for something simple and standard, or a custom designed masterpiece, CPR Outdoor has the range for you to choose from and competitive prices to match. CPR Outdoor patios are built to withstand the conditions of the South West whilst being a functional and stylish compliment to your home. So why should you choose CPR Outdoor Bunbury or Busselton to supply, install and maintain your patio? In a market where franchises and big company branches tend to dominate, Bunbury and the South West boast a unique culture of supporting local and benefitting hugely from it. CPR Outdoor have operated has a family owned business in the South West for over 15 years and are proud to be the leading patio suppliers and installers in our community. We also fabricate all our materials and manufacture all products in-house, so no need to wait for shipping from overseas or interstate. CPR Outdoor Bunbury and CPR Outdoor Busselton pride themselves on a highly skilled team of manufacturers and installers, employing local staff and providing regular training to be up-to-speed on the latest in patio design, manufacture and installation. When your supplier is local, they understand your needs and when they are professionally trained and valued as an employee, they bring the best quality product to you. 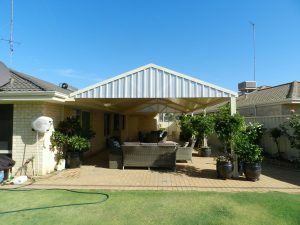 CPR Outdoor exclusively uses Bluescope steel products to ensure the superior quality of our structures. Colorbond ensures a stunning finish to your patio and quality workmanship provides peace of mind when it comes to the engineering aspect of your outdoor living space. Choosing a supplier for your patio requirements is easy when you have a professional, local choice on your doorstep. For all of your patio design, manufacture, supply and installation requirements call CPR Outdoor Centre Bunbury on 9726 2311 or CPR Outdoor Busselton on 9754 2657 today for a free quote. How long will it take you to finish my patio? Who Takes Care of the Paperwork For My Patio?